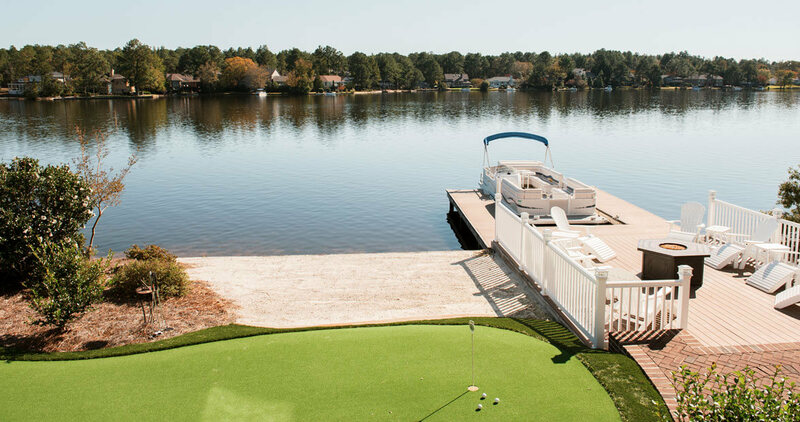 At one couple’s dream vacation home on Lake Pinehurst, stunning backyard views — and fun — are par for the course. Charm went a long way with Todd and Joni Locke 11 years ago when the couple was deciding between a vacation home in Florida — where Todd’s family had a place — and Pinehurst, where Joni’s parents went to get away. 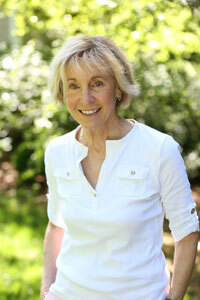 “We loved the small-town quaintness of Pinehurst,” Joni says. “Just driving in makes us relax.” Those who’ve traveled the village’s serene and winding streets, shaded by towering pines, would certainly agree. Nearly hidden down one of those winding lanes is Lake Pinehurst, where the Lockes found their shoreline dream home. Vast floor-to-ceiling windows provide a view of the sparkling, breeze-ruffled water, and sunshine pours into the house. In fact, the only place where natural light isn’t available is the hearth, where fieldstone reaches to the vaulted ceiling, and the “theater room,” outfitted with reclining loungers, the better to watch movies or sporting events. Because … golf. Sure, Pinehurst has terrific shopping and restaurants, and a climate that means gift-from-God 75-degree days in February, but it also has nine golf courses at the Pinehurst Country Club alone, and the Lockes are fans. Instead of a trophy case or mounted deer head hanging on one wall, you’ll find a curious wooden holder bearing dozens of diminutive scorekeeping pencils. Each one is stamped with the name of a course that Joni’s parents have played: Grand Geneva Resort, Oldfield Club, Wexford Plantation. The backyard is an AstroTurf putting green for impromptu competitions between guests who visit from the Lockes’ hometown in Ohio. The Lockes’ pontoon fits snugly at the dock, and paddleboards and kayaks are a favorite of their son, who’s in the service and often brings his buddies to visit. One day, the Lockes hope grandchildren will play on the ready-made beach just steps from the green. Can you build a drip castle with sand trap sand? No matter. For now, the couple, who call themselves “sunrise people,” can take in a sunrise to the left every morning, and a sunset to the right, over the dam, every evening. And if the weather takes a turn and a February snow does fall on the back nine? “We play right through it,” Todd laughs.